The study of small RNA helps to understand part of the gene regulation of a cell. There are different types of small RNAs, the most important in mammals are miRNA, tRNA fragments and piRNAs. An advantage of small RNA-seq analysis is that we can study all small RNA types simultaneously, with the possibility to also detect novel small RNAs. bcbio-nextgen is a Python framework supported by a big scientific community that implements best practices for next-generation sequencing data and uses gold standard data to validate its analyses. It is well known for its variant calling and RNA-seq pipeline. Now bcbio has an small RNA-seq pipeline that allows quality control, adapter removal of fastq files, annotation of miRNA, isomiRs and tRNAs, and genome-wide characterization of other types of small RNAs. Here, I show the capabilities of the pipeline and its validation using data from the miRQC project. miRQC provides samples with known relative amounts of small RNAs, enabling comparison of quantitation and detection of miRNAs. The main goal was to test different platforms for miRNA detection, but these are also great samples for benchmarking tools. The samples in miRQC are: one Universal Human miRNA reference RNA (Agilent Technologies, #750700), one human brain total RNA (Life Technologies, #AM6050), several human liver total RNA (LifeTechnologies, #AM7960) and several MS2-phage RNA (Roche, #10165948001). Moreover, two more samples were created using different concentrations of UHmiRR and HBR. And finally, two miRNA families were spiked in human liver and MS2-phage samples. We integrated cutadapt allowing a minimum read size of 17 nts and removing the adapter if it is at least 8 nts long. bcbio uses seqbuster for this step. It has been used by GEUVADIS consortium for miRNA quantification and allows isomiRs analysis as well. Read more about why isomiRs are important. Although not covered here, it is important to mention the pipeline uses miRDeep2 for de-novo miRNA discovery. In this case, it uses all samples for this analysis and then seqbuster for quantification of only the novel miRNAs. bcbio uses seqcluster to detect unique units of transcription over the genome, allowing resolutions of small RNAs found in multiple genomic locations. Normally these small RNAs are dropped because they map multiple times on the genome and require special analysis to avoid bias in the quantification. Read more about why other small RNAs are important. 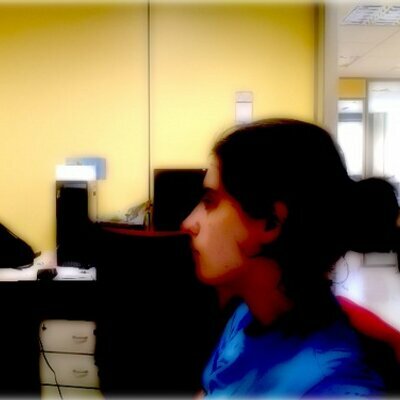 This tool produce a sqlite3 database for visualization. An image example is here. bcbio summarizes Fastqc metrics for each sample. Together with different metrics from the previous steps, the user has an idea of the quality of the samples and the overall project. It includes fastqc results, size distribution after adapter removal and amount of small RNAs mapped to miRNAs, tRNA, rRNA, repeats among others. Other metrics such as, amount of data used until the end of the analysis, or warning flags if the data is noisy, are provided by seqcluster and included in the final R markdown template report. bcbio generates a R markdown template report to visualize results from each of the steps. It is inside the report folder in the working directory or final folder after the analysis. The mirRQC samples allow us to measure quantitation and detection accuracy of specific miRs for the tools integrated in bcbio. 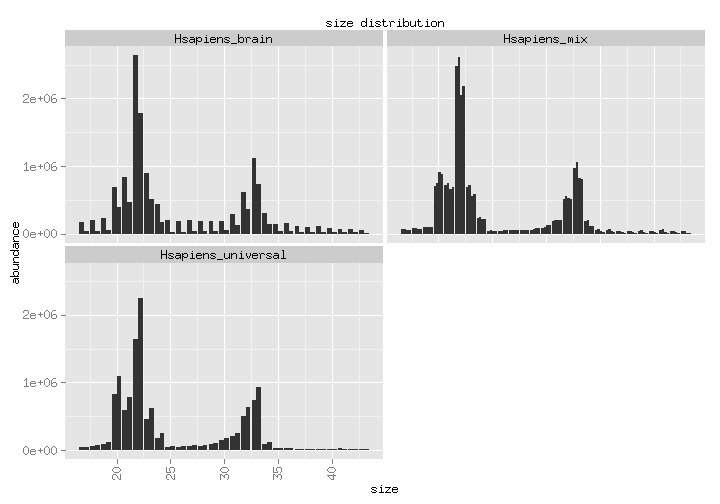 The size distribution is a first estimate of the quality of your data. In a normal small RNA sample we should see a peak at 22/23nt and maybe another at 26 or 31 depending on the biology of the samples. note: there may be specific cases where this assumption is not true, but it applies to the majority of projects. 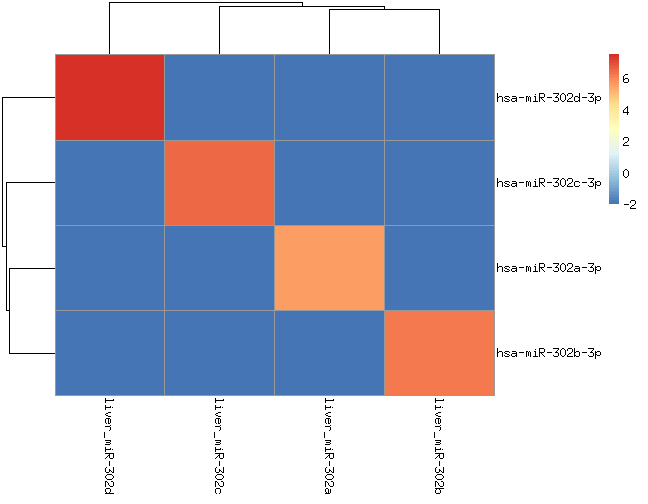 These samples (termed miRQC A–D) consist of 100% Universal Human miRNA Reference RNA (UHmiRR; A), 100% human brain RNA (HBR; B) and two titrations thereof (C = 0.75A + 0.25B and D = 0.25A + 0.75B). After the analysis with bcbio, we can calculate the miRs that follow the relative abundance rule. To measure this, I took the average from the replicates and kept only the miRs with a median > 5 counts after upper quantile normalization among samples. That is more than 95% of accuracy for miRs with more than 5 counts. To evaluate specificity we used samples that included specific miRNAs that are not normally expressed there. These samples were analyzed in a different run. 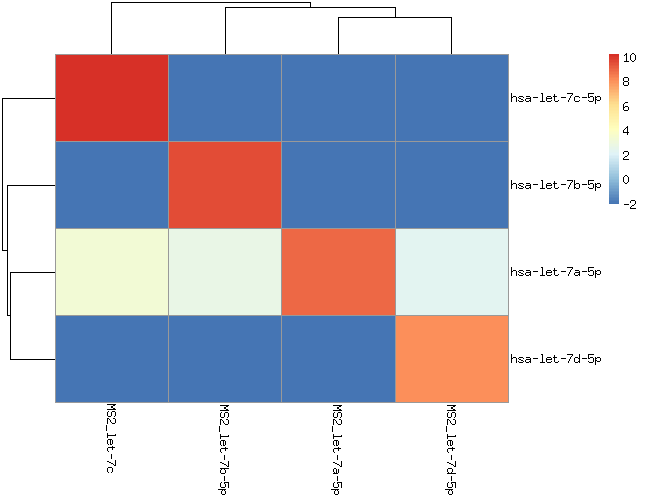 This analysis uses samples from 4 human liver RNAs and 4 MS2-phage RNAs with 8 synthetic miRNAs from two families (miR-302a/b/c/d and let-7a/b/c/d). We should only see those miRNAs (let-7 and miR-302 families) in those samples. Only sequences that appear > 2 times in the fastq files are considered. hsa-let-7a appears in all samples. If you check the processed data, this is not due to incorrect alignments. It would be interesting to figure out whether this signal is because of contamintation or errors during sequencing or/and during amplification. The running time for 8 samples with 6 millions reads each was 3 hour and 19 minutes. 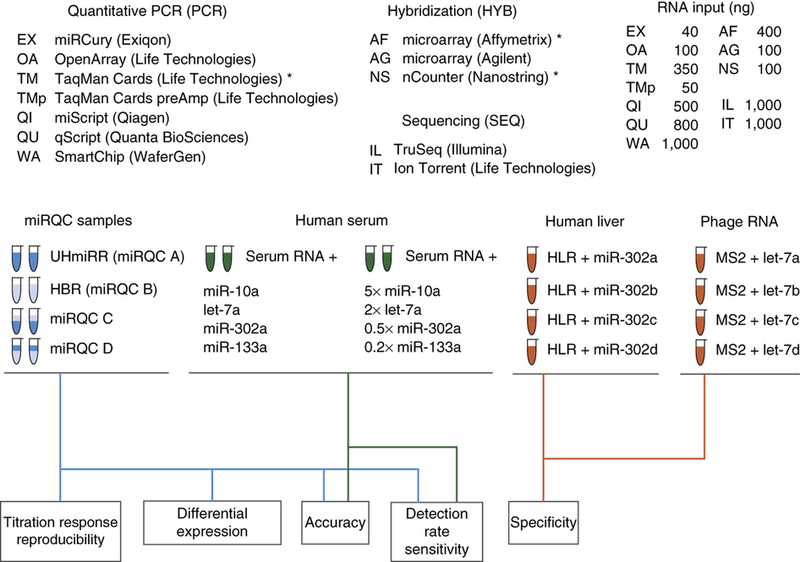 We conclude that the current analysis has a reliable quantification and specificity of miRNAs and other small RNA molecules. What’s more, it helps with the downstream analysis creating a complete R markdown template that covers the most important section of small RNA studies. I am currently implementing post-processing steps of the tDRmapper (analysis of tRNAs) output to allow an easy differential expression or clustering in downstream analysis. In the future, I would like to implement proTRAC for the analysis of piRNAs. Harvard T.H. Chan School of Public Health for supporting the integration of small RNAseq pipeline in bcbio. Special thanks to @roryk and @chapmanb. Research Computing at Harvard Medical School: Chris Botka, Director of Research Computing and all the people in the team. Special thanks to the authors for making their validation data available. I encourage use of this data for any tool that analyzes small RNAs.